This year's Focus on the Family Advent devotional calendar will help your family keep Jesus at the heart of the holiday season. This free download is a great way to improve your kids’ Bible literacy and understanding of the real Christmas story. Prepare for Christmas with 23 days of Scripture readings and devotions. As you read through the daily devotion and complete the kid-friendly activities, you will be building family memories that last a lifetime. Don’t miss out! 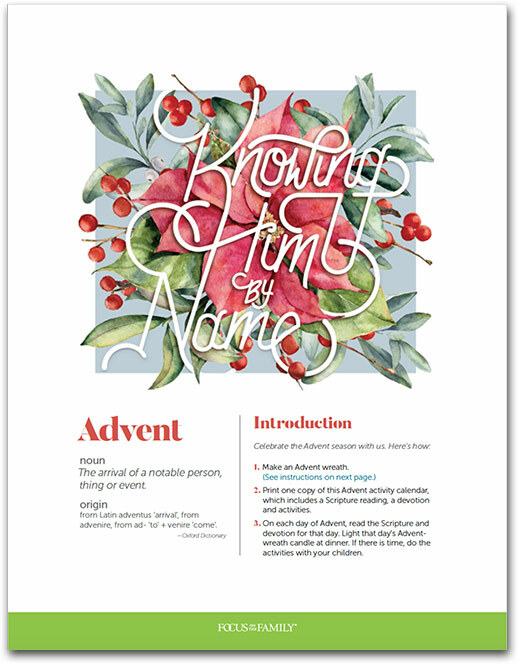 Advent begins on Dec. 2 this year, so be sure to start a new family tradition and count down to Christmas with our latest Advent devotional calendar, “Knowing Him by Name”! Get your free Advent devotional calendar today! Please send me relevant email updates and promotional offers. We will send the download link for this resource to your email address.